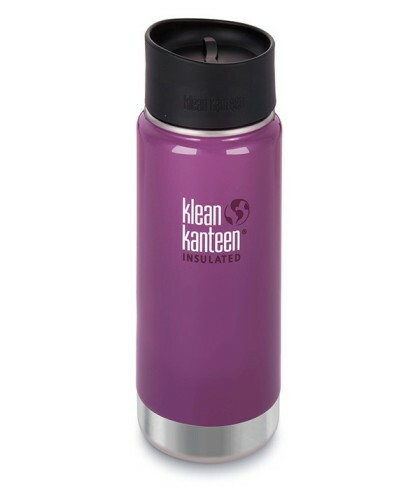 The Klean Kanteen Wide Insulated 473 ml can be used as a mug, thermos or insulated bottle. Whether picnicking, hiking, at sport, on the job, on the go or just relaxing it’s a must for enjoying that ice-cold drink, hot chocolate or pasta. Klean Kanteen bottles combine high performance and practicality with style – it’s a great looking bottle AND leak proof with either a Cafe Lid 2.0 or a Stainless Steel Loop Cap (Loop Lid sold separately). Klean Kanteen Wide Insulated bottles’ double-walled vacuum insulation keeps contents at stable temperatures – up to six hours for hot foods and liquids and more than 24 for iced drinks. To clean your bottle, handwash in warm soapy water.